Only half an hour's drive from Bury St Edmunds, Hollow Trees Farm is at Semer, near Monks Eleigh. The farm has a wonderful trail suitable for all ages, which circles around a large variety of animals and activities. There is a fantastic farm shop and café, which are extremely popular and quite often very busy but very child-friendly. The farm trail is open daily all year round from 900am - 400pm, and is only £2.50 per person (free for children age 2 and under). You can buy animal feed for 50p a bag which is particularly good for feeding the goats and the chickens. Although it can get very muddy, as you can see in the pictures, there is a path all the way round, making it accessible for buggies and wheelchairs. The thing that really appeals to me here is how open it feels. There are chickens wandering around all over the farm, and all the animals have lovely large enclosures and paddocks. It is really good for toddlers as there are very few areas that they can't see into. I hate it at some zoos when the walls are so high that little people can't see the animals! There are places to step up onto for feeding the animals, and a very exciting feeding station for the goats, which you can turn yourself. 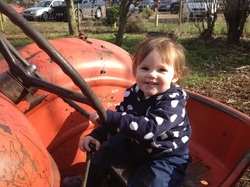 There are also a few old tractors which are fantastic for toddlers to sit on and "drive", as well as an adventure play area, with tunnels and ropes to climb on for bigger children. For up to date news and prices, and for directions, check out their website here. *Opening and closing times may vary during seasonal events - please be sure to check their Whats On page for confirmation.